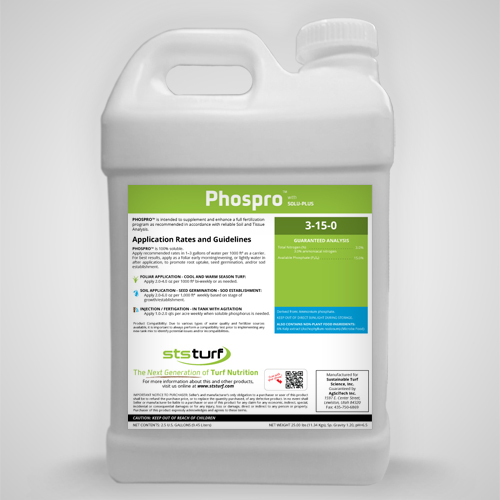 Phospro 3-15-0 delivers available phosphate (PO4) to ensure optimum rooting, metabolic functioning, and energy transfer. Phospro 3-15-0 contains our proprietary cold processed Norwegian Sea Kelp (Ascophyllum Nodosum), which further enhances rooting potential, chlorophyll formation, and supplements plant health with vitamins, enzymes, anti-oxidants, plant defense elicitors, and fermentation extracts. Contains Solu-Plus to further optimize rooting with multiple rooting stimulants. Phospro 3-15-0 contains plant available phosphate, a constituent of nucleic acids, phospholipids, coenzymes, and most importantly ATP. Our unique cold processed Solu-Kelp, complements the phosphorus, delivering naturally occurring phytohormones that promote cell division, or cytokinesis, in plant roots and shoots. Other components include organic compounds, amino, humic and fulvic acids, complex carbohydrates, anti-oxidants, plant defense elicitors, and fermentation extracts.